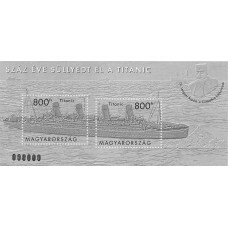 On 13 April 2012 Magyar Posta issued a special stamp block in commemoration of the Titanic and dr. Árpád Lengyel, surgeon of the British steamship Carpathia, which was the first one to arrive to the rescue of the Titanic. On 15 October 2012 the representative publication will also be issued in the form of a black print. 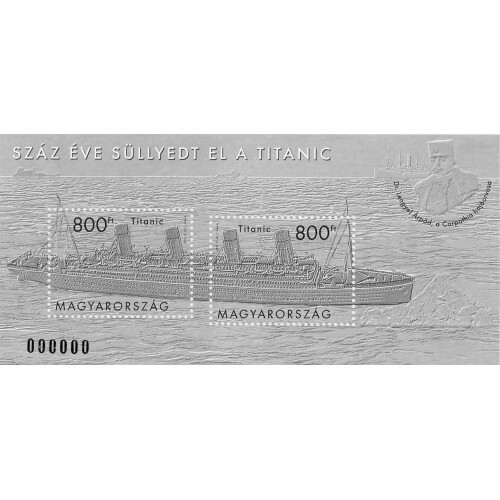 The main motif of the serial numbered black print, which has a format completely identical to that of the stamp block except for its colour, is the Titanic moving towards the iceberg, and parts of the ship are shown on the perforated pictures. On the top right part of the frame drawing the portrait of dr. Árpád Lengyel and the contours of the steamship Carpathia can be seen. The special feature of the publication is that the offset printing process was supplemented with raised printing. The Titanic was built at the Harland and Wolff shipyard in Belfast, Northern Ireland, and when it sunk it was the largest passenger liner in the world. She left the port of Southampton on 10 April 1912 with 2,207 passengers on board. Several ice warnings were received on the evening before the disaster, but some of them did not even reach the bridge because of the high volume of telegrams. Although the Titanic was the largest and most elegant vessel on the Transatlantic route, she was not the fastest, which jeopardised the planned arrival in New York on 16 April 1912. It was one of the reasons why she did not slow down or why she did not avoid the area with drifting ice. At 23.40 p.m. on 14 April the lookout spotted a floating iceberg.